ThirstyAffiliates is more than just a run of the mill affiliate link cloaker – it’s a tool designed for bloggers to make money. That’s why so many blog owners are using ThirstyAffiliates to manage their affiliate links. 10x Your Affiliate Marketing Efforts – FAST! Convert more of your blog visitors into affiliate income without annoying your audience. Provide the keywords and your affiliate link will be linked automatically. Charts and tables full of useful statistics, plus regular admin email reports. Optionally uncloak links for total compliance with Amazon's terms of service. Front end link fixing script ensures your affiliate links are always up to date. Never miss another affiliate link 404 error with proactive link checking. Manage your affiliate links via CSV. Easily import/export & update across sites. Support for importing from 3rd party APIs like Amazon Products API. Tight integration with Google Analytics. Pushes click event when affiliate link clicked. 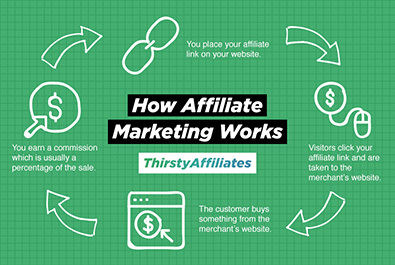 ThirstyAffiliates is trusted by thousands of affiliate marketers & bloggers worldwide. It’s compatible with all affiliate programs and will help you monetize your WordPress site with affiliate marketing. Guides to help you get more traffic, increase affiliate sales and monetize your site more effectively. Interested in becoming an affiliate marketer? Perhaps you're curious about how it works? The concept of affiliate marketing may be alien to some people but if you give it time and learn about it, it can be a really exciting venture. So if you are ready, here’s what you need to know about this industry and how you can work it out. You've seen all the videos on how great life can be after you start your affiliate marketing journey and how you'll be making thousands per day. But what are the next steps? I have to admit they sell the dream pretty good. This article will demystify and show you the path with the next 3 things you need to do. What is link cloaking? Primarily, link cloaking is a defence against commission theft in the affiliate marketing industry which is a serious problem. But are there any other benefits? When should you cloak your links? This guide will take you through the ins and outs of link cloaking.